The Junior League of Evanston-North Shore strives to make an impact in the lives of women near and far. Those familiar with the Junior League of Evanston-North Shore may already be aware of its mission statement: an organization of women committed to promoting voluntarism, developing the potential of women, and improving communities through the effective action and leadership of trained volunteers. What many may not know about is the broad extent of the organization’s global reach—one that The Association of Junior Leagues International (AJLI) prides itself on. While the Evanston-North Shore League has approximately 300 members, it is part of a much larger force: 291 Junior Leagues and 150,000 members across four countries—the United States, Canada, the United Kingdom, and Mexico, to be exact. 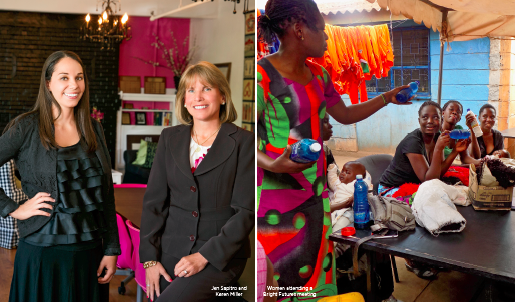 It was AJLI’s new vision statement—“Women around the world as catalyst for lasting community change”—that particularly caught the attention of Miller, who was serving on the Association’s board of directors at the time. “We started to ask ourselves and our League leaders, ‘what does women around the world mean?’” she explains. As such, AJLI expanded their scope to encourage its women to visit other countries and volunteer together—an opportunity that Miller was able to experience firsthand when she traveled to Guatemala last January with 30 other Junior League members nationwide. “We learned what it was like to immerse ourselves in a new culture and what skills were necessary to make our work effective,” she says. For this reason, Miller feels fortunate that she picked up the phone one day in 2006. The voice on the other end belonged to Jen Sapitro, a pre-med student at Northwestern University who was hoping to apply for a scholarship through the Junior League to help finance a volunteer trip to Nairobi, Kenya. “Jen was so passionate about volunteering at an orphanage for the summer, and I said, ‘yes, great, please apply,’” remembers Miller. Since 2004, the League has provided more than $50,000 in scholarships, and while it’s often targeted at graduating high school students, the scholarship committee felt unanimous about giving Sapitro the opportunity based on its alignment with their focus on their mission and vision. After her six-week trip, the Naperville native returned to the League to share photos and stories—along with her plans to return to Africa soon. “The trip changed everything for me and my perspective about what I wanted to do,” explains Sapitro. She dropped plans of medical school and instead set out to receive her Masters of Public Health in International Health and Development at Tulane. It was a career path that would afford her with more chances to travel to Kenya—including an internship at the close of her program that would turn into a permanent move to Nairobi in 2011. It was then that Sapitro began to invest all of her time in Uweza Foundation, a nonprofit she founded in 2008 that fights the cycle of poverty in Kibera, Nairobi’s largest slum, through community-based empowerment programs. The organization focuses on motivating children through education, talent development, and life skills building, which they accomplish through a range of activities, from a soccer academy and art program, to a journalism club and solar bulb project. There’s also a new Bright Futures program that provides economic training to women looking to start their own businesses, which the League helped fund through a grant. 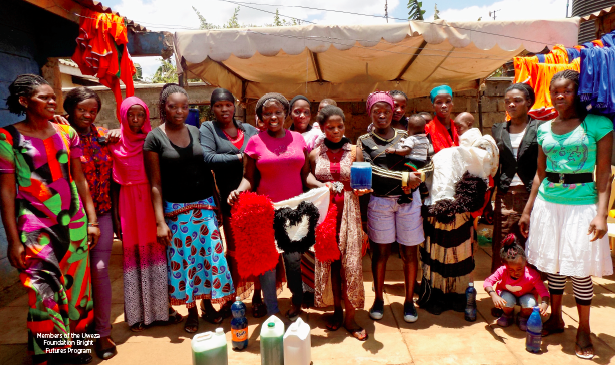 A mother to a one-year-old with her husband Stam, whom she met in Nairobi, Sapitro is now a large part of those communities—a choice that she credits to Kibera’s people and energy. It’s a “here” she feels very fortunate for, and one that she continues to thank the Junior League of Evanston-North Shore for today.